other customers looking at this product. You also meet the expectations of consumers who, nowadays, expect to see that type of socially-sourced information before they proceed to buying. compatible with CS-Cart Ultimate, which means ability to specify different settings for each of the storefronts. The pop-up shows the recently purchased product. You can use a cron job to update the number of purchased products. Otherwise, you will need to update the number of purchased products manually using the Number of times this product was bought field in the Add-ons tab on the products editing page in the admin panel. [!] The popup did not show up. Fixed. [!] Users messages were not displayed in the BigPicture template. Fixed. [!] Product view notifications in the BigPicture template were not adapted to the mobile version. Fixed. [~] The ability to clean the table that contains information about customers who have viewed the product has been added. [~] Random messages display logic has been restructured. [!] Disabled products displayed in pop-up windows. Fixed. [!] The text in the add-on messages was in the language different from the storefront language. Fixed. [+] The setting which allows placing a pop-up to the top of the screen has been added. [+] The setting which allows specifying the frequency of the pop-up. [!] The custom message did not display in the Big picture template. Fixed. [!] The link remained after the pop-up was closed or disappeared. Fixed. [+] The Show minutes setting has been added on the Pop-up tab of the add-on settings. [~] The cron now updates the number of purchased products for the real and fake data. The setting up and using the cron is now obligatorily for the add-on. [~] The code has been improved, resulting in significant improvement of the add-on performance. [~] The display and location of messages on the product details page has been improved. [!] The nouns was declined incorrectly with numerals in the pop-up for the Russian localization. Fixed. [!] The pop-up with fake data was displayed incorrectly for multiple storefronts. Fixed. [!] The pop-up with fake data was not displayed for the products which were available on pre-order only. Fixed. [!] The products which were already displayed were not deleted from the queue. Fixed. [~] The popup is now not showing if the product is out of stock. [~] The popup is now not showing while placing an order. [~] The interval has been changed to 30-60 seconds between popups. [~] The adapted to the third-party UniTheme theme add-on has been updated to the latest version. [!] The 'Number of times this product was bought' setting was displayed on the vendors product editing page even if the 'Use fake data' setting was disabled. Fixed. [+] The ability to manage display of the messages on all pages has been introduced. [~] The logic of showing the messages on the category product page has been improved. [~] The logic of showing the pop-up about the recently purchased product has been improved. [!] The Service unavailable error message appeared if the 'Number of times this product was bought' setting was enabled, the 'Use fake data' setting was disabled and 'Count purchases' setting was set per day, week or month. Fixed. [!] The messeges about the number of people looking at the product and number of views were not shown on the quick view. Fixed. [!] The Service unavailable error message appeared if the 'Number of times this product was bought' setting was enabled and the 'Use fake data' setting was disabled. Fixed. [!] 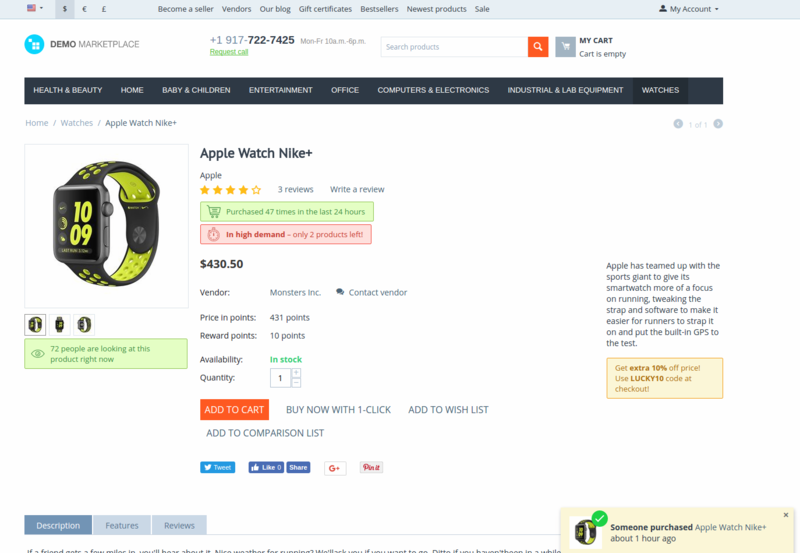 Messages were not displayed if the 'Product details page thumbnail width' field was empty in the Thumbnails settings. Fixed. [+] The ability to show the number of products purchased per period has been added. The available periods are: within the last 24 hours, week, month or for all time. [+] The ability to show the number of product views per period has been added. The available periods are: per day, week or month. [+] The ability to manage showing the messages on the category product page has been added. [+] The ability to see cron status in the browser using a cron link has been added. [!] The pop-up showing a recently bought product displayed the product not from the current storefront. Fixed. 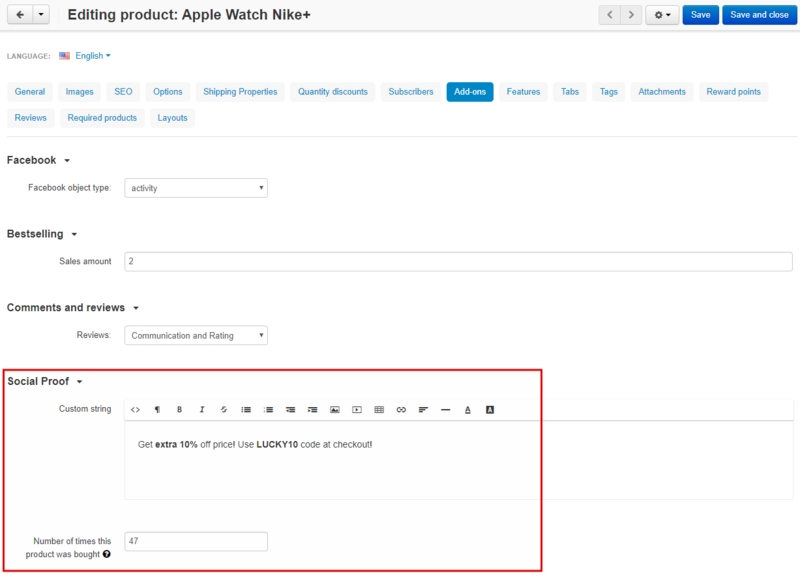 [+] The ability to disable showing the Purchased X times in the last 24 hours message if a product is out of stock has been added. [+] The Use fake data setting has been added for every message. [!] The message about a product left in stock was shown even if a product was out of stock. Fixed. 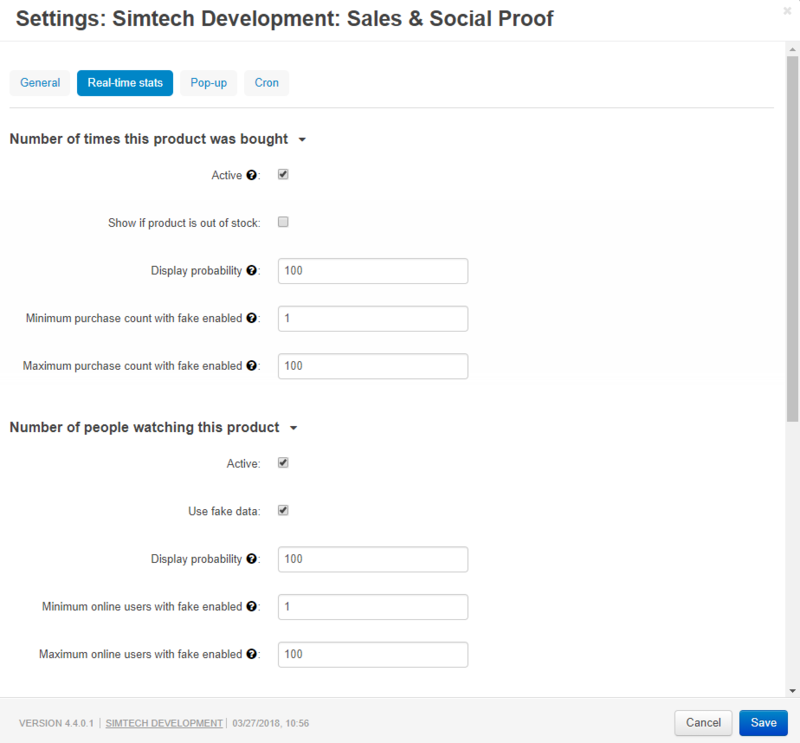 [~] The name of the Social Proof add-on has been changed to Sales & Social Proof.